Tom Montgomery has a bachelor's degree in Mathematics from the University of California, and a J.D. from the University of Washington School of Law, from which he graduated with honors in 1990. He was the Associate Editor–in–Chief of the Washington Law Review. Following law school, Tom served for two years as a law clerk to the Honorable William L. Dwyer, United States District Court Judge for the Western District of Washington. 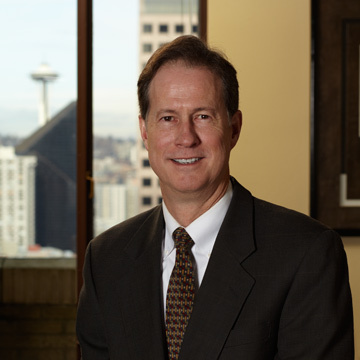 His practice since has focused principally on commercial and personal injury litigation in maritime and railroad settings, including insurance defense, coverage cases, contract disputes, wrongful death, and tortious interference, to name a few. Tom is rated AV by the Martindale–Hubbell Law Directory. Before attending law school, he was Controller of an Alaska seafood processing company. Tom is a member of the bars of both Washington and Alaska, and is admitted to practice in the United States District Courts for the Western District of Washington, the Eastern District of Washington, and the District of Alaska, as well as the Ninth Circuit Court of Appeals. He is a member of the National Association of Railroad Trial Counsel (NARTC) and Maritime Law Association (MLA). Tom has served on various federal and state bar committees over the years, was a board member of the "Millionair" Club Charity from 1994 until 2010, and was a long–time youth sports coach and volunteer. When not working, Tom enjoys spending time with his family, running, traveling, and playing real baseball on real grass.